The RIBA has awarded Richard Murphy’s new house a UK National Award. This was presented at the RIAS Centenary Dinner in Glasgow. Richard and Gareth Jones were joined on the platform by Steve Evans of Inscape Joinery, the contractor. This is our twenty-first RIBA Award. Hart Street is now on a list of twenty houses for RIBA/Channel 4 Grand Designs “House of the Year” and the Channel 4 team are filming at the end of July for transmission in the televised competition in the Autumn. The exact date will be advised in our next newsletter. 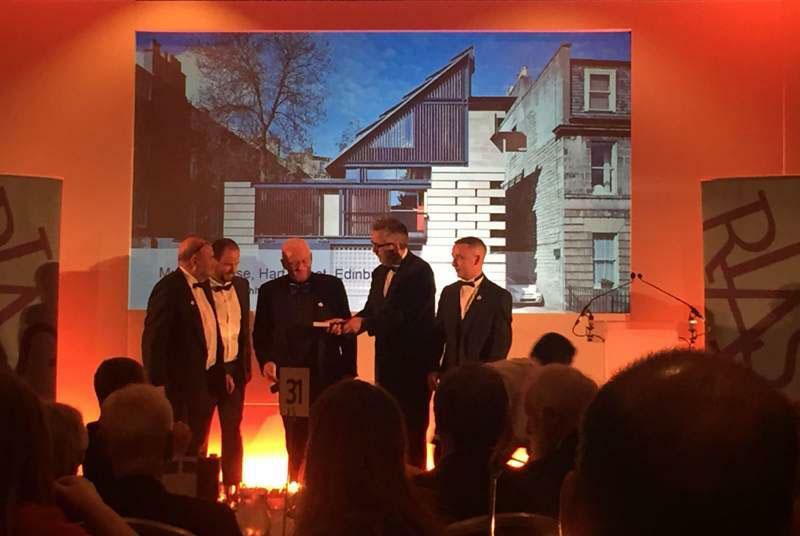 In addition the Edinburgh Architectural Association awarded the same building their highest accolade “Edinburgh’s Building of the Year” at the EAA Awards Ceremony. Meanwhile our completed project for Anglia Ruskin University at Young Street scooped the “Best Building of 2015” Award from the Cambridge Construction and Design Forum. 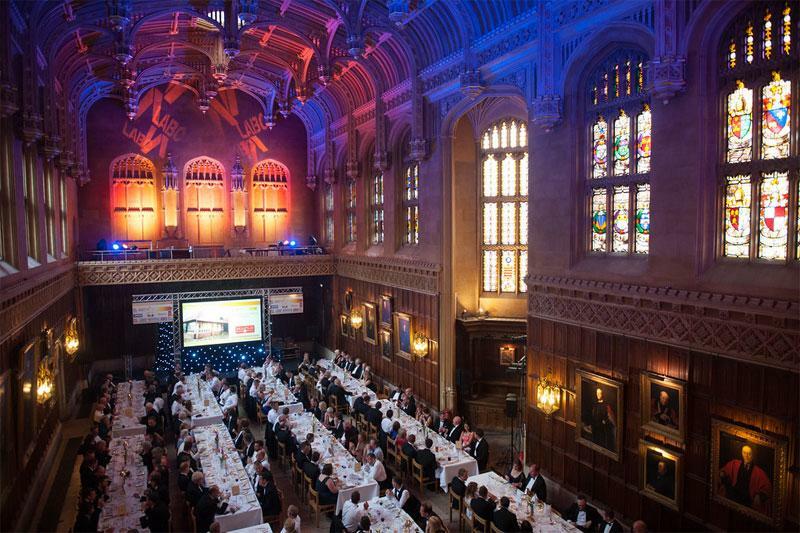 At a prestigious dinner for 400 in Kings College Dining Hall the new campus won their top prize. 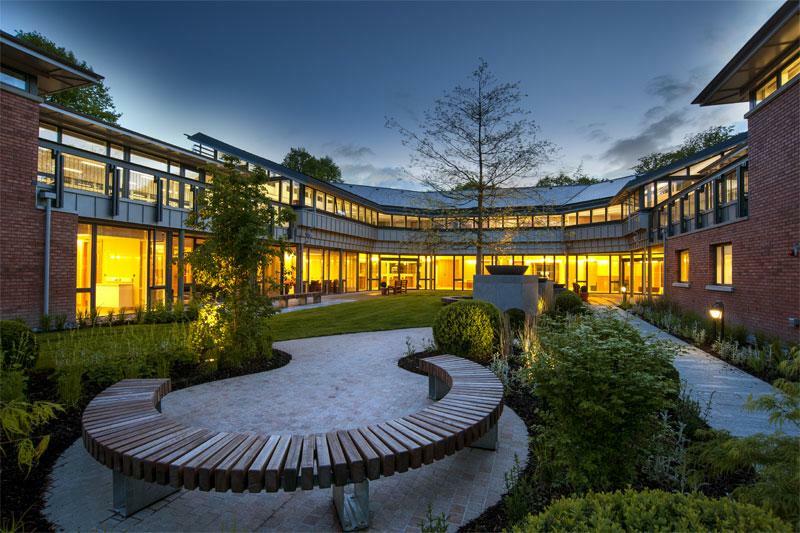 It has also won “The Best Educational Building in East Anglia” from the LABC. AND A EUROPEAN HEALTHCARE DESIGN AWARD! Old See House in Belfast, a community mental health building designed in association with RPP architects has won the best Mental Health Design Award in the European Healthcare Design Awards 2016. The Rugby Pavilion was handed over to the Edinburgh Academy at their playing fields on Arboretum Road. Meanwhile, the Hockey Pavilion, completed in May 2015, won the Wood Award from the Edinburgh Architectural Association. The Academy is planning a celebratory day on the 27th August to officially open both buildings. The extension to our own design at the Galeri Creative Enterprise Centre in Caernarfon has been granted planning permission by Gwynedd Council. The building consists of two cinemas, offices and a new entrance to the whole building. Drawings have been posted on the project page on our website. 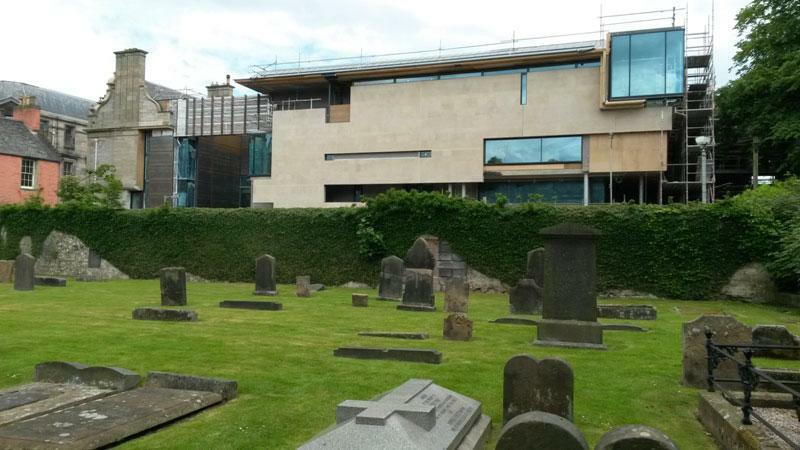 Scaffolding has come down over most of the west elevation at Dunfermline Carnegie Library & Galleries. Fife Councillors toured the site last week and their visit was featured prominently in this article in The Courier. 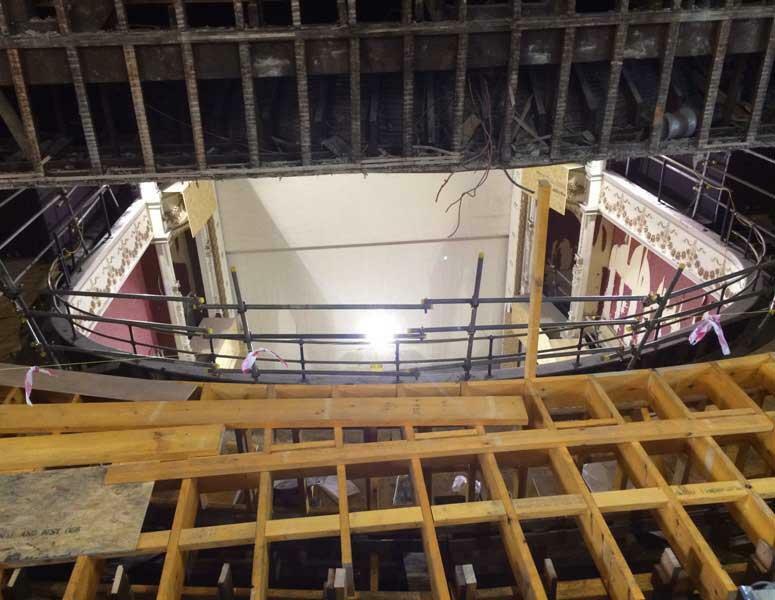 Robertson Construction has been on site at Perth Theatre for three months and has completed the demolition of the east side of the building, revealing the side wall of the original theatre which will become a key part of the new foyer. Piling for the new building has been completed and the strip out of the remaining existing buildings is progressing rapidly. 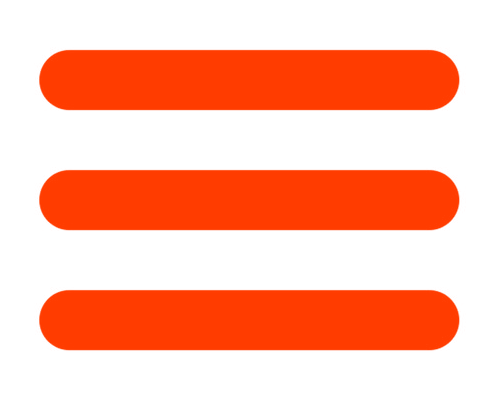 The project is due to be complete in the latter part of 2017. Our joint project at the National University of Ireland, Galway with Taylor Architects of Castlebar is progressing well. 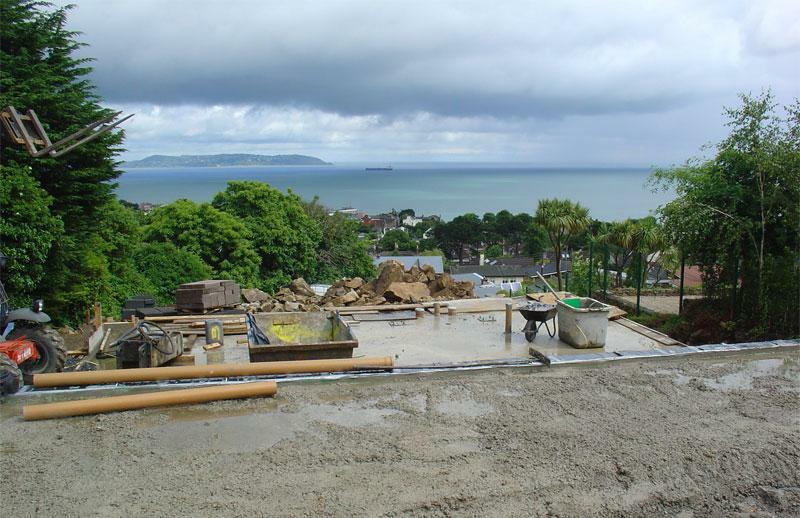 They tell us that the building is almost wind and water tight with a view to a completion date of the end of August. 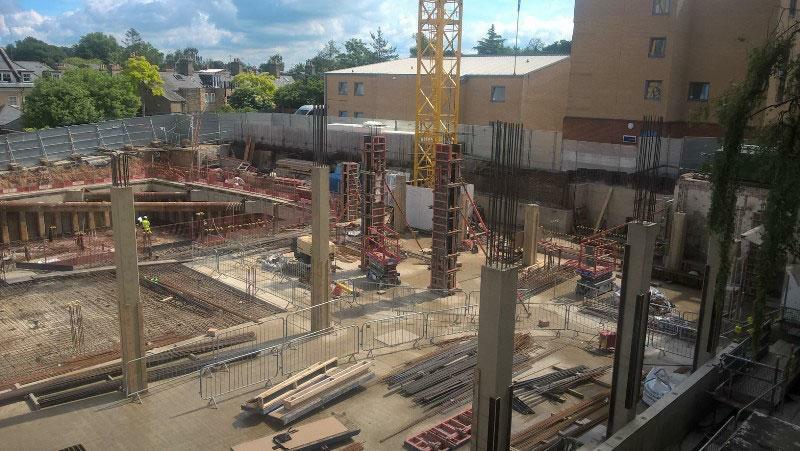 Foundations have been dug and the concrete frame has been started at Anglia Ruskin University's East Road Campus. The photograph shows a magnificent and temporary corner brace to the retaining walls for the new Science Faculty Building. 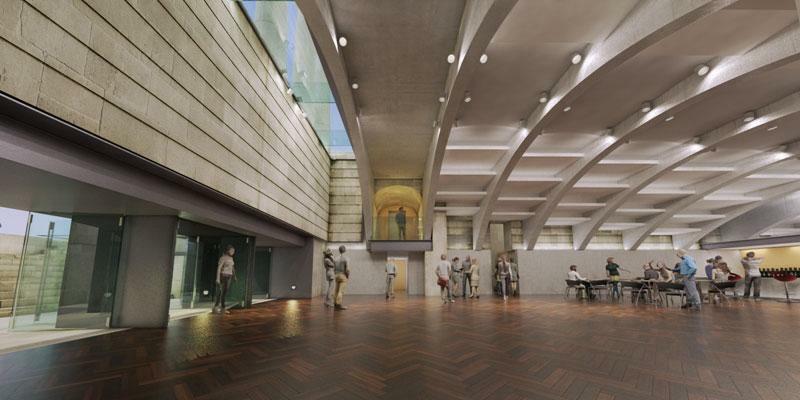 17th August is the date that the Planning Committee will consider our proposals to convert the building into the new St Mary’s Music School and concert venue. Councillors recently toured the site with Matt Bremner. Currently the finishing touches are being put to the business plan and we hope to have a recommendation for approval from officials. 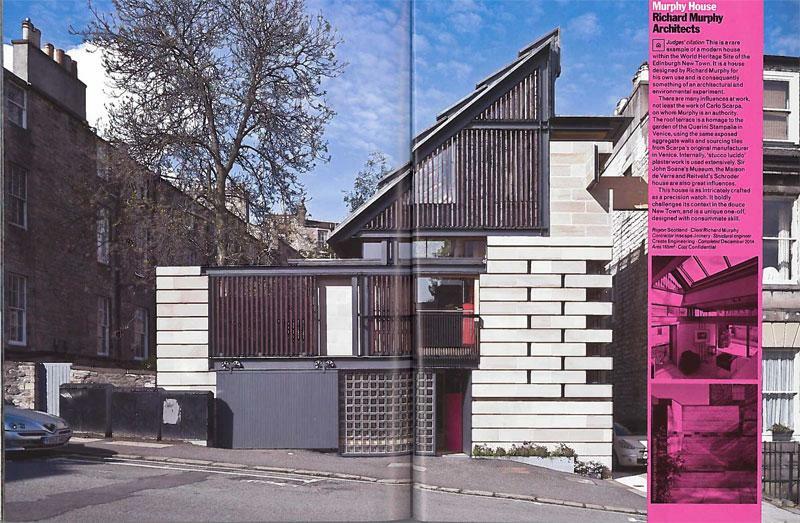 The Architects’ Journal (23.06.2016) gave the house a prominent double page spread in its round-up of the UK’s RIBA Awards and it also featured in the London edition of the “Metro” newspaper and on BBC News Scotland's website. Richard opened his house to Exhibition visitors and also to attendees of the RIAS Convention. Visitors paid £10 a head and together the visits raised £800 for the Maggies Centre. Twenty five students from Lund University in Sweden visited the office and were guided on a tour of a number of the Practice’s Edinburgh projects. 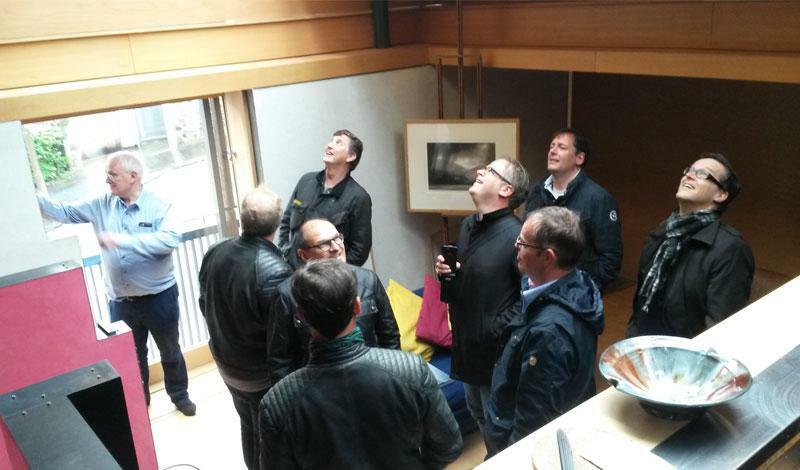 On a separate visit a party of a dozen German Architects who were particularly interested in housing did the same. Richard has talked at the Edinburgh Science Festival on “Healthy Cities” and contributed to the first of the RSA Architects’ Conversations with Paul Williams of Stanton Williams on the subject of “Building with History.” The series, an RSA/NMS contribution to the Festival of Architecture, has now seen four Conversations completed with two more scheduled for the Autumn. Richard was the Keynote lecturer at the Inverness Festival of Architecture Conference and talked on the Practice’s work and at a “Building the Future” Conference on health and architecture in Groningen, Netherlands where he co-presented the Belfast Community Mental Health Building at Old See House in Belfast in collaboration with RPP Architects. Richard spoke at the RICS Commercial Property Conference in Edinburgh on 16th June and at a London Conference on innovations in student housing on 24th June. In addition to the “House of the Year” filming Richard has been filmed for a documentary on the Maggies Centre and also for a BBC film celebrating the 250th anniversary of the Edinburgh New Town. Richard has been invited to present the Young Street Cambridge project to a conference of the Institute of Historic Building Conservation on October 4th at the Royal College of Physicians, London. And finally, in the Autumn Richard will be speaking at a Conference on conservation and heritage in the Aberdeenshire area at Haddo House on 27th October. 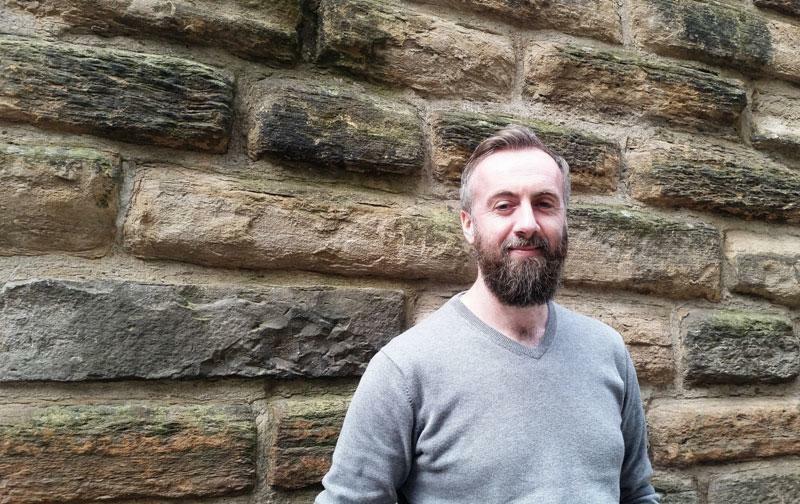 We are delighted that Peter Hunt has accepted the position of Associate with Richard Murphy Architects. Originally from Longford in the Republic of Ireland, Peter has been with the practice since 2006 and was heavily involved with our Award winning project at Justice Mill Lane in Aberdeen. Peter was also the project architect on a new house at Strathaven. 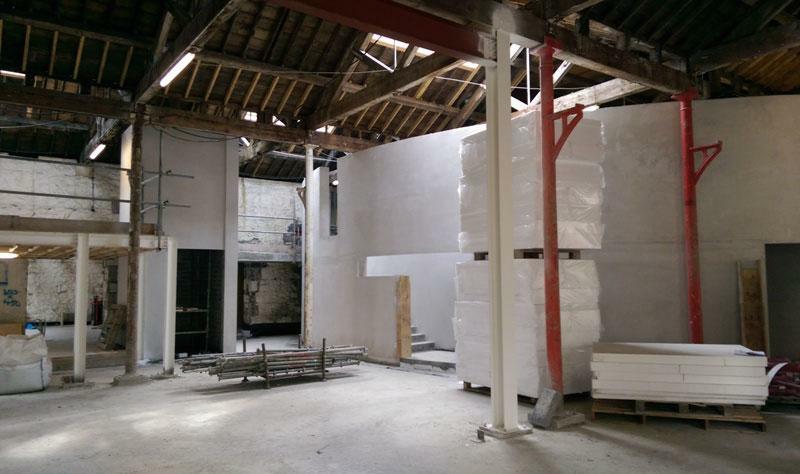 For the last three years he has been working almost exclusively on the Haymarket project. 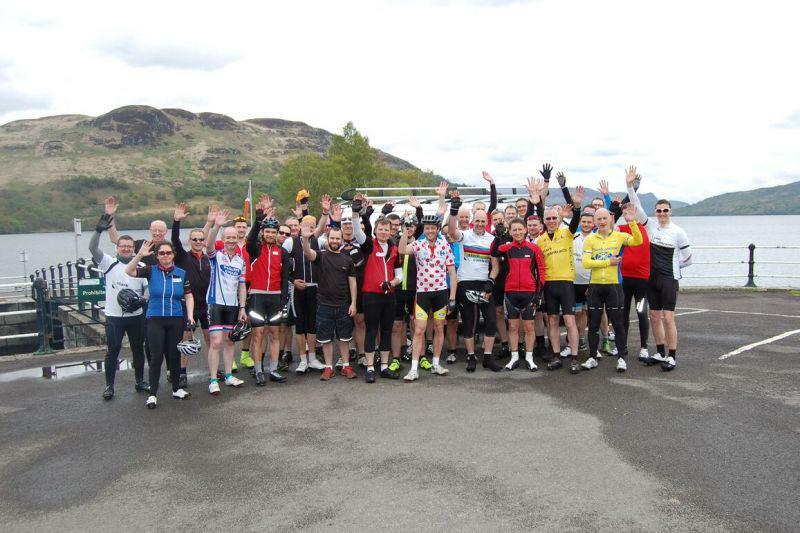 James Mason and Ian Masterman competed, as the Richard Murphy Architects Team, in the Clark Contracts 5th Annual Spring Classic cycle race around Loch Katrine scoring fifth and eleventh places respectively. It’s a little known fact that James leads a double life as a Spin-master of a spinning class in Lifescycle in Bonnington and can be found there every Saturday morning at 830am barking his commands! In fact the office is full of cycling fanatics. Matt Bremner had been known to fall off his mountain bike in night rides at Glentress and Bill Black frequently cycles sections of the Tour de France, (a few days later than the actual race). About half the office cycle to work and some have taken advantage of the UK Government’s “cycle to work scheme”. It's the 25th Birthday of Richard Murphy Architects on 1st October 2016... a weekend of celebration, talks and visits is being planned. More detail will follow in the next newsletter.